Midwestern Gothic – A Literary Journal » Blog Archive » Issue 16 is Available Now! Issue 16 is Available Now! Midwestern Gothic Issue 16 (Winter 2015) is here! This issue not only kicks off the new year with new stories from prominent Midwestern Voices, it also features the winners and finalists of the first annual Lake Prize, judged by Ander Monson and Mary Biddinger. featuring fiction from Aaron M. Geer, Dani Heinemeyer, Nikki Kallio, T.j. Martinson, Angela Mitchell, Nora Neill, Brian Petkash, Lee Ann Roripaugh, Sarah Terez Rosenblum, Katie Steen, Michael Stoneberg, Ben Tanzer, Jackson Tobin, Douglas Trevor, Mike Wilson. Poetry from Justin Brouckhaert, Sarah Carson, Laura Donnelly, Jennifer Finstrom, Ting Gou, Alisha Erin Hillam, Marlin M. Jenkins, Sara Quinn Ravara, Holly Jensen, Brandon Rushton, Bailey Spencer, Matt Tordoff, Kerry Trautman, Wendy Vardaman, and Abigail Welhouse. 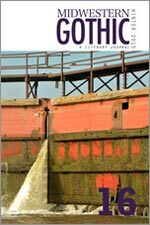 Midwestern Gothic is a quarterly print literary journal out of Ann Arbor, Michigan, dedicated to featuring work about or inspired by the Midwest, by writers who live or have lived here. Midwestern Gothic aims to collect the very best in writing inspired by the Midwest.